Notice the color of the infected leaf on the right. OSU Extension Plant Pathology Slide Collection. Cause Vein yellows reportedly is incited by a long, flexuous virus that is identical to or very closely related to Apple stem pitting virus. The virus is found in many noncertified European pear cultivars, many of which show few if any symptoms. Vein yellows virus and Red mottle virus are strains of the same virus. Symptoms Symptoms on sensitive cultivars develop on leaves in spring and are most conspicuous by midsummer. General weathering of leaves in late summer and autumn makes symptoms less conspicuous. Early symptoms appear as small, pale yellow spots or blotches, usually associated with the finer veins and sometimes banding them. Symptoms are more pronounced on young (nursery) trees than on old (orchard) trees. Symptom severity can vary from year to year. It is not known whether the red mottling and flecking symptom usually associated with vein yellows is caused by certain strains of the virus or by a distinct virus. 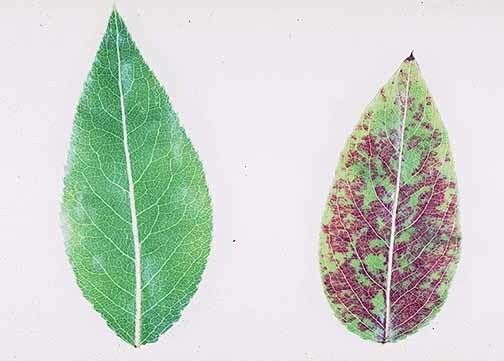 Symptoms of red mottle are most pronounced in late summer and autumn. They appear as scattered dark red spots or flecks usually associated with the finer veins. Nursery pear trees with vein yellows and red mottle have a yellowish, unthrifty appearance. Trees infected with severe strains of vein yellows are about half the size of healthy trees. Most Oregon-grown cultivars do not show leaf symptoms. Use scions and rootstocks that have been tested and found free of all known viruses. Heat treat infected tissue at 37°C and then propagate by meristems or shoot tips. Reference Sutton, T.B., Aldwinkle, H.S., Agnello, A.M., and Walgenbach, J.F. 2014. Compendium of Apple and Pear Diseases and Pests, 2nd ed. St. Paul, MN: APS Press.